NASA's Mars Exploration Rover Spirit used its panoramic camera (Pancam) to record a 360-degree vista, dubbed the "Everest" panorama, from the top of "Husband Hill" in early October 2005. This view is a stereo anaglyph of the Everest panorama, showing it in three dimensions to viewers using red-blue stereo glasses. 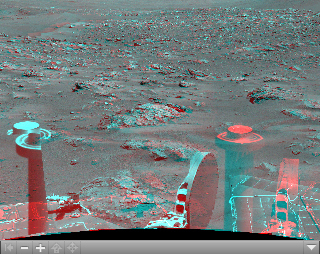 The images combined into this anaglyph were taken through the Pancam's blue L7 and R1 filters during Spirit's 620th through 622nd Martian days (Oct. 1 through Oct. 3, 2005). Geometric and brightness adjustments have been applied. The view is presented in a cylindrical-perspective projection with rover tilt removed. For additional information about the Everest panorama, see PIA03095.